← Secrets of personal transformation: What’s missing from the mind-as-onion metaphor? Everything we do is goal directed, whether we are pursuing success, accomplishment, satisfaction, service, love, acceptance, or simply comfort and the absence of pain. Goals are always with us, whether consciously acknowledged or not. We seek them, achieve them, fail at them, savor victory, suffer disappointment, or retool to pursue a new choice. We each have a relationship with, or a way of relating to, our goals. Indeed our relationship to any particular goal we have may be different at different times. Some of the possible dynamics of our relationship with our goals will be explored here. Sometimes we run… is a metaphor that illustrates some of the ways we relate to our goals. What is your relationship like with your goals? This is typically true when your goal is avoidance of pain, failure, or discomfort. Scurrying away from danger, real or imagined, is like chipmunks fleeing from the birdfeeder when the cat walks through the yard. Running away is certainly necessary sometimes, but when it is because of fear and anxiety the best you can expect to achieve is safety and comfort. At its extreme the only goal here is avoidance without hopes for the future to embrace. Most aspire for more than that, but many live in run away mode. There is another run away mode. You know you want something, but you run away as you get close or when you make progress. This is most frustrating because you feel like you have two minds, one that approaches and one that is afraid or uncertain. In a way this is true, we often have two minds. Competing goals are a major challenge to change and growth. For instance, when you go for something your life inevitably changes and your comfort zone is disrupted. Your goal for comfort or safety may feel threatened; so you run away to the familiar. This pattern can be unconscious and messed up if another part of you really wants something! Being aware of this, knowing yourself, can help you choose and not just behave automatically. Consider why you run away sometimes. This is the other side of the equation. 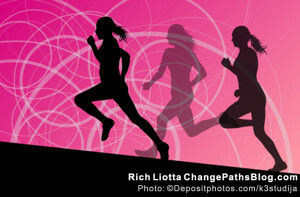 To achieve, accomplish, or change you need to be running toward something! You may run toward your goals with determination, though you may have fear and doubt, you’re going for it anyway. You find the resources within to proceed with uncertainty. You find the courage and strength to not run away-back into your old shell. You are not behaving automatically, at least not yet, but consciously and with resolve. There are many ways to run toward your goals and the effort will pay off. The magic comes when you run toward effortlessly. It can happen. Believe it! This may be with eagerness and fervor, doing everything you can to close that gap between where you are now and your goal. Perhaps for you the goal is always in sight, it is a part of you, and calls to you like a soul mate you are destined to meet. Or you may run with cool confidence and a steady stride conscious of challenges, believing that success is ahead! Running away and running toward are the most basic types of relationships we have with our goals. How you relate to your goals determines, to a large extent, whether you will achieve them or not. There are more dynamics of our relationship with our goals that will be addressed is posts coming soon. Next time one of the most powerful and compelling ways to run will be presented. By: Rich Liotta ©2009 This article was previously posted last year on this site. This entry was posted in Achieving Goals, Enrichments, Mind and tagged enrichment, goal setting, goals, personal growth, self-improvement, transformation. Bookmark the permalink.